practical techniques for personal growth, health and positive change. This page contains several articles providing a brief “how to” of pragmatic, detailed steps that can be taken to begin or deepen your own personal progress to a happier, more aware life. 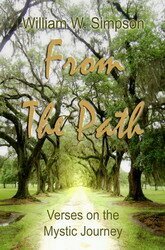 They are excerpts from a new book now available on this website, or from your favorite book store, entitled “From The Path - Verses On The Mystic Journey”. In addition to the discussion of practical techniques located directly below, new discussions about meditation, affirmation practice, prayer and other spiritual practices are always being uploaded to our Spiritual Techniques Uploads Forum. To visit our forum, click Here and look for "Spiritual Techniques". Most of us live in a whirlwind created by our thoughts and activities. Our conscious attention is not on our life, but on the thousand things to do and say. We have a choice, whether to be driven by our desires for fortune, fame, the right work, doing a good job, finding the right mate, improving our health, or a limitless number of other hopes and desires – or to consider some alternative. These hopes and desires, thoughts and actions, create the whirlwind. And to the degree we are emotionally and physically moved by them, we immerse ourselves in that whirlwind. Eventually, we forget that being happy is important – that appreciating the beauty of this moment is necessary for our health. Rather, we continue to be driven deeper and deeper into “doing” and we may lose our “being”. But, there is another way. There is a life with more joy, more peace, more health, more sincere appreciation for the constant gifts of life and love. Where to begin? Carl Jung said, "Your vision will become clear only when you can look into your heart. Who looks outside dreams; who looks inside, awakes." That permanent reality has been described in most religious traditions. But don’t be blinded by taking the descriptions literally. They are only pointers. There is only one true description of that inner reality – the one that you discover for yourself. There is danger in taking someone else’s truth without making it your own. You give up your power of choice and thereby your freedom. You are not here to live a two dimensional life in which you are merely the sounding board for other’s ideas and experiences. You must free yourself if your are to be free. And you can only be free through your own self effort. There are others who will help you. There are those who will sustain you unseen. But these graces and blessings are not enough without your effort. You were given free will for a reason. This is the one real power that you possess. You have the power to go or stay, to love or hate, to heal or kill. However, many times you give up your chance to use your free will by letting circumstances or other people or habits, make your decisions for you. Mahatma Gandhi said, “You must be the change you wish to see in the world”. Choose to find your own, personal discovery of the purpose of your life. Choose to take control of your behavior, your thoughts and your feelings. Choose to begin by exploring within. Now you can listen to this collection of spiritual poetry on two CDs, read by its author, William Simpson. From The Path - Verses on the Mystic Journey - $19.98. The two CD set also includes a bonus section entitled "First Steps" - a collection of practical techniques for growth and transformation including detailed instructions on: Practicing The Presence, Affirmations, Meditation, Chanting Om, Watching The Breath, Sitting In The Stillness, Love, Giving All Actions To God and Practicing "The Last Day". If you choose, love can be your constant companion. Love can be a conscious feeling within yourself that nurtures and sustains you in every moment. It is a feeling of joy, exuberance and nurturance. It is a feeling of well-being – knowing that regardless of outer circumstances, there is a part within you that is vibrantly, energetically radiating calm, confident goodness. To worship at the temple of the heart. In this path, be one with a heart full of compassion." This love is the lubricant of living. It is the substance that will smooth the rough edges of your life. It is a sweet fragrance that permeates all your life’s experiences, giving you an enhanced perspective on the ups and downs of daily living. When others argue with you, or blame you or accuse you – in circumstances that normally would cause you to flare with anger – love can provide the anchor that allows you to genuinely remain calm and aware. This response must be contrasted with “controlling your temper” which means that you don’t express your anger, but within, are controlled by it. Awareness is the primary goal. With the ability to be present to each experience with awareness, every other goal which you set for yourself will be achieved. However, to meet each moment with awareness requires love. Will power is not enough. Rigid control is not enough. Determination and energy are not enough. These qualities are commendable and necessary, but they are not effective enough by themselves to give you a platform upon which to stand and be present to the moment and aware of it. Love is that platform. It places us outside of our ego self. Not through force, but through attraction. We are drawn to the perception of love within us, like the bee is drawn to the flower. Then, our seeking of love is not a task, but a desire fulfilled. Mother Teresa said, “Love is a fruit, in season at all times and within the reach of every hand. Anyone may gather it and no limit is set. Everyone can reach this love through meditation, the spirit of prayer, and sacrifice." Do not seek for knowledge on how to love your brother. Seek how to feel love within yourself and you will automatically express that feeling to your brother – and to all that is. Become love and you will automatically radiate it in all circumstances to all people and to that which is beyond the material world. If you want something more in your life. If you finally recognize that the way the outer things of life change is not within your control – if you finally recognize that the only way for your life to improve, is for you to change – then, you are ready for the next step. The second step is to develop the tools of personal change. The primary tool is your awareness. Your ability to perceive what is, in an unbiased, unprejudiced, persistent way - detached discrimination. Discovering what is, leads to knowledge. Knowledge will show you what exists at the core of life-reality and what you must do to relate to it. Awareness will define your course of action. As your awareness increases, you will know the next steps in your evolution. The purpose of applying the tools of personal change to is increase your ability to remain present in the moment with awareness. Each moment is unknown before it appears and you are subtly afraid of the unknown and therefore carry a background of fear in most of your life. Fear inhibits awareness. These tools are all effective at increasing your awareness. However, they work in different ways and work harmoniously together to achieve your goal. Any one of them will help. All of them combined will accelerate your growth. Most of these practices stem from one of three primary traditions: Yoga, Buddhism or New Age (which is an amalgam of the first two along with lessons learned through psychology, 12 step programs and other new 20th and 21st century experiments). Mind is the thinking tool inside your head. Your mind is a wonderful tool, but it has taken control of you. One of the primary goals in improving your awareness is for you to gain control of your mind - so that you can decide when you want to use it, how you want to use it, and when you do not want to use it at all. The impact of your thoughts on your feelings, beliefs, attitudes, values, health and success can not be over-stated. By impressing the mind with thoughts that you have consciously chosen, you begin to take control of your feelings, beliefs, attitudes, values, health and ability to succeed. In addition, you begin to take control of your ability to discern the deeper reality. “Practicing the presence” works at directing the mind in a consciously controlled direction. It consists in selecting a short thought and mentally repeating it over and over, in every spare moment throughout the day and night – continually for weeks, months or even years. In time, you will learn how to practice this technique even while doing other tasks – going for a walk, dancing, driving, working in the yard. Eventually, it is even possible to maintain your practice while performing more involving tasks such as having a conversation. Practicing the presence is a way to create positive, heart-centered thoughts and carry them into your daily life. No particular words are important in themselves; there are no “magic words”. However, the words can be magic, if they affect you – if they stimulate you to feel their meaning. Repeating the words, without any additional effort will help. However, the key to successful practice is to “feel” the meaning behind the words. If you practice the phrase “I am well”, for example, explore what feelings come to you as you mentally repeat those words. Immerse yourself in the feeling till it is all that you perceive. With continued practice you will immediately feel the effect of your phrase as soon as you start repeating it. Eventually, that feeling will be with you or immediately available to you, as part of your every day attitude and mood – as part of your nature. When the feeling and meaning of your phrase has gone that deep, you have successfully changed your self and your life, in a positive way. The ultimate expression of this practice is to practice a phrase that opens the door to feeling God’s presence. Many of the techniques discussed in this article are practiced in our guided meditation recordings, "Discovering Spirit" and "Embracing The Stillness". Both are available in our products catalog. Click Here for more details. Affirmations are similar to the short phrase used in practicing the presence. Both are positive expressions that we impress upon the mind. Both are directed toward redirecting the continual thoughts going on within the mind. However, there are differences. Affirmations tend to be longer statements. They try to create a complete context for a particular attitude, feeling, insight or realization. They are designed to be practiced with complete concentration and are not created to be practiced while performing other tasks. To get the best results, set aside time, even if only 2 or 3 minutes a day, to sit down, close your eyes, focus the attention at the point between the eyebrows and practice your chosen affirmation in a quiet place without distractions. Begin by speaking the affirmation out loud. Speak slowly and with complete awareness on the meaning of the words. As you continue to repeat the affirmation, speak more and more softly and slowly. Eventually, continue to repeat the affirmation mentally rather than vocally. Let the affirmation go deeper and deeper into your mind. As with practicing the presence, try to experience the feelings you would feel if the affirmation were true. Allow the affirmation’s truth to be absorbed in your every atom. “Feeling” is the key. There are affirmations available from a very large variety of sources. In addition, you can create your own. For several examples, look in our Affirmations section. If you are interested in learning the step by step details of how to practice affirmations, consider some of our audio CD products specifically designed to develop and deepen your affirmation practice. Of all the tools presented here, meditation is the most important. It is the most effective. However, it is also the most subtle and may often feel unproductive, if you require an instant perception of progress. There are a large variety of meditation techniques. Some involve bodily movement, some looking at an outer object such as a candle flame or mandala, others involve chanting or listening to a sound, such as a gong or bell. These are all effective and may be appropriate techniques with which to begin. Your goal in meditating is to allow the mind to relax and for thoughts to slow down and eventually stop – even if only for short periods of time. During your meditation, always keep your attention on the meditation technique. When thoughts intrude, do not get caught in the loop of recognizing that you’re thinking and then have an additional thought that makes a judgment on you for thinking, and then having another thought that you should stop thinking, etc. This chain of thoughts can continue throughout your meditation time. This is not meditation – this is thinking about issues relating to meditation. As you are able to let your thinking subside, you will discover spaces between your thoughts. These spaces are created by the technique. Let these spaces expand. Inwardly, rest in these spaces; embrace them. One preliminary technique is the chanting of “Om”. Sit quietly with eyes closed and your attention focused at the point between the eyebrows. Inhale gently and when your lungs are full, exhale the breath while making the sound of “Om” on any pitch that is comfortable to you. When you have completely exhaled, chanting the sound, then inhale and chant again. Continue this process. The first object of this technique is to exhale the breath and sustain the sound as long as possible. Let the whole process be slow, relaxed and sustained. You will find as you continue to practice, that your breathing will become slower and the duration of each breath longer. Continue to relax into the sound, refocusing your attention back to it when thoughts intrude. You can practice this technique as often as you like. Practicing for five minutes continuously, will be beneficial; practicing for 20 to 30 minutes once each day will have a wonderful effect. You will notice that you are more calm, more peaceful, more relaxed. In addition, your awareness will be sharper, you will perceive at a subtler level. Colors, sounds, the expressions on other people’s faces will all seem more expressive. Toward the end of your practice, try chanting “Om” internally in your mind, rather than outwardly using your voice. Keep your attention on the continuous sound of “Om” within your mind. The Om technique is also a great first stage in practicing more than one technique during your meditation period. It internalizes the mind, quiets the body and creates fertile soil for further work. The goal of most meditation techniques is to still the mind while maintaining alertness. If you find yourself getting sleepy, make sure that your eyes are turned slightly upward toward the point between the eyebrows – without straining. If your eyes look downward for very long, you will slip into subconsciousness and sleep. We offer two guided meditation recordings on CD that includes detailed practice of this technique. Click Here and Here for details. As in the Om technique, go to a place that is quiet, where you will not be disturbed. Try to create a space within your home, where you always sit to meditate. Let it be your sanctuary. Sit comfortably, with your eyes closed and gently turned upward toward the point between the eyebrows. Try to sit with your spine as erect as is comfortable for you. Do not strain. The essence of meditation is relaxation – if you are exerting effort to sit more straight than you are comfortably capable of, you are not meditating – you are posing. Begin by taking a slow deep inhalation; then gently, slowly exhale. Do this 2 or 3 times, to relax and slow down the body. Now, watch your breath. Watch it flow in – watch it flow out. Do not take control of your breath, let it breathe by itself. Your purpose is just to watch. Like watching the waves of the ocean come up on the beach, and then ebb away. Just watch the breath. When you find that you have lost concentration on the breath, just return your awareness to it. Keep your thoughts to a minimum. Initially, it may help to mentally think the word “In” as you breath in, and the word “out” when you exhale. This will help you to maintain attention. Practice this way till you can effectively meditate in this fashion for at least 5 to 10 minutes. Then try the same technique, but without thinking any words. Just place your complete attention on the process of breathing. The benefits of this practice would require a book unto itself. Over time you will experience more and more peace, calmness and eventually a spontaneous joy. This is not just a technique with which to begin your exploration of meditation. This is a technique that will provide new and continuing benefits even after many years of practice. Do not confuse this techniques simplicity with lack of power - it will cultivate a deeper consciousness that will lead you to the goal. After you have completed the practice of your techniques; take time to sit in the stillness. One of the ultimate goals of the meditation process is development of the ability to sit quietly without thought and yet with complete awareness and presence of mind. As this ability slowly develops, you are beginning a new phase in your journey – this is really meditation; everything else was preparation for this. Let your self just rest in the stillness and darkness within. Avoid trying to see anything – this is not an activity of the eyes. It is an activity of your ability to “be”. Just be present, without thought. When thoughts come, as soon as you become aware that you are thinking, just let go of the thought. "Thoughts of themselves have no substance; let them arise and pass away unheeded. Thoughts will not take form of themselves, unless they are grasped by the attention; if they are ignored, there will be no appearing and no disappearing." One way of working with sitting in the stillness is to imagine that you are in a forest and that you know a very rare and unusual fawn is hiding from you. You want to see the fawn, but it is extremely shy and will continue to hide, or even run away if you make the slightest sound. The fawn is so sensitive that it can hear your thoughts. However, if you are able to watch for the fawn without thought, it will come out into the clearing and you will see it. It will eventually come up to you and eat out of your hands. The goal which we seek through meditation is the fawn. And, in one way, you could say that it is shy. As long as we are thinking or perceiving something else, it will stay hidden. To the degree that we are not only present without thinking, but also overflowing with love and joy, then the fawn is magnetically drawn to us. When you are attempting to sit in the silence, but you’ve lost your way – remember to look for the fawn. There is a complete universe that is hidden from the ordinary person. Just as the human ear can only perceive within a certain band of frequencies, and can not ordinarily hear anything outside those frequencies (even though they are present and other animals perceive them); so it is that most humans have so much static within their awareness, in the form of thoughts, that they are unable to perceive their essential nature and their connection to the universe, even though it surrounds them at all times. And, because you can not perceive it, you tend to believe that it does not exist. This perception can not be forced. Forcing, in fact, is exactly the opposite approach in order to be optimally effective at expanding your awareness. Be comfortable with the idea that you are moving along the path through your daily practice, even though you may not perceive any change in your perception within your practice. An attitude of comfort and satisfaction that in the mere doing of your practice, you are doing your part – doing a good thing - is most beneficial. Avoid becoming attached to “results” from your awareness practices – become satisfied with the mere “doing”. In addition to your efforts at “inner work”, it is important to do the outer work also. The inner practices alone, will not provide you with the complete change that you desire. It is equally important to work on your behavior, your habits and your values. These two streams of practice, working together and interrelating will provide deep and significant results, in time. The primary guideline to outer practice is – do unto others as you would have them do unto you. If you can practice placing yourself in the other person’s shoes, genuinely trying to see their position, or action, or responsibilities as your own, and then observe how you would act under those circumstances; you will grow in understanding and patience. If you are to learn to love, then love must be put into action. Make believe that although you are in perfect health, today is the last day of your life on earth. Try to feel with conviction the truth of this belief. What is important now? What is worthwhile to do? To think? To feel? Compare the importance of the people in your life to the things in your life. Compare the value of smiling to your spouse versus cleaning the house, or the car. Compare the value of saying "I love you" to someone - anyone, versus watching your favorite television show. If you take the time to stop reading this book, to close your eyes, and authentically practice this - you will realize the greater value of humans and our relationships than with things. However, for most of us, our priorities, in our daily lives, are reversed. It is said, that after we die, after we drop these bodies and realize that we still exist, we reflect back on our life. We reflect on our actions and our priorities. When this moment comes, I pray that you and I will look back with some satisfaction and joy, rather than regret and sorrow. We can make the decision to refocus our values and our actions now - or, we can put it off - and perhaps add another regret later on. As we continue to act in the outer world, we continue to create good, neutral or bad results. Jesus said “As you sew, so shall you reap”. Simply put, what you put out into the universe will come back to you. This is the law of Karma. Part of our goal in continuing to interact with the world is to first improve our Karma – that is, try to consciously take action to do the right thing – the loving thing, and eventually to stop creating any Karma at all. One way to step out of the constant circle of experiencing the results of our prior actions is to perform all actions for God. If our intention in taking a particular action is genuinely only to please God, to express our love for God, then that action creates no resulting Karma for us in the future. One way to practice this, is to say to yourself as you are taking action, “I am doing this for God”, or “Lord, I am doing this for you”, or “Lord, receive this as an offering (or gift) from me”, or “Lord I am giving this to you as a sign of my love”. This can be applied to the most momentous or most apparently insignificant activities. Try it while you brush your teeth. Give those actions, those few moments directly to God as a gift from you heart. After you’ve got the hang of it, try the same technique in more complex or more “important” activities. While you take a walk, give each step of the walk to God. When you ask your boss for raise, give the entire experience and the results to God. When you have to make an important presentation, or you are in the middle of an artistic creation, when you are arguing with someone who is important to you – all of these are opportunities to give each nanosecond of the experience as an act of love and service to God. Can you watch television and give each moment of the act, and your reactions to what you see, to God? In addition to being relieved of the consequences of these actions, or perhaps, as part of the effect of taking action in this way, you will find that you no longer have to worry about the consequences. You may find that, although you think you need a raise and deserve a raise, you can comfortably feel that whether you actually get the raise is up to God and that you can accept any result with equanimity. Continued practice of this technique in more and more of our life’s activities will lead to a greater calmness, a greater confidence, and a greater peace of mind that your life is progressing in the best possible way and that God is the one who is guiding you through its various twists and turns. Please click the "PayPal" button below. Even $1.00 Makes A Difference.